I am sharing a story from life to #SpreadTheVibe and highlight the good in this world, for Indiblogger and Youth Ki Awaaz. It was a cold, rainy day in monsoon. I was working late in office as a major client escalation was going on and I was required to handle it personally ensuring the timeliness is not lost during delegation. I did not realize the time and when I stepped down from my office, I was surprised to see an unexpected heavy downpour. Though my office was not very far from my home, getting a conveyance was big challenge though. There will be a lot of autorickshaws near the compound but they won't budge unless they get a fare greater than 10 KMS. Commuting from work to home was one of the biggest challenges that I faced every day where in irrespective of weather, I needed to wait for hours below my office in search for a conveyance that will go from Malad west to Kandivali west. My attempt to offer additional Rs 50 for the ride was in vain too. They say when something has to go wrong, it will nevertheless go wrong and, go wrong in all possible ways. Well, that was the day which perfectly lived to this adage. I was not keeping well and had a long day in office while resolving the escalation. The escalation was resolved amicably but left the bruised and unwell me totally drain of my spirits. Besides, the harsh Mumbai Rains and the crude breeze made it difficult for me walk on the under construction, lightless road near my office. Given the rain situation the availability of autorickshaw was scarce and I have to get home anyhow. That time even my parents were not staying with me so I could have asked them to fetch me and my husband was away on a tour. So I was helpless from all direction and have to give on my faith. I stood on the road with my half battered spirits for long, half drenched in rain, seeing the passersby go. That moment I really cursed my inability to drive and lack of s support system. If only if I have left early, I would have got an auto and would be home but that would have made my business client out of his telephone network for another few hours in spite of him being a sweet and genuine person. My thoughts and fear were rested by a familiar voice calling me- Ekta Mam', Ekta Mam ...from a distance. 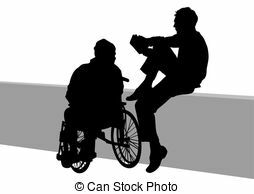 I turned around to look at the direction of the sound and found a wheelchair laden girl standing near an auto calling my name, signaling me to come. Apparently, she saw me waiting there, struggling for a conveyance and wanted me to offer the only hope that she got for herself to reach her home. I recognized her face and moved towards her direction. The road was slippery and I was very cautious while walking with my own injured leg. She came forth in her wheelchair, offering me her hand to cross the water laden road. I was really touched by her gesture and thanked her profoundly. However, seeing her condition I refused to take the auto alone and offered to come along till the main road. Since we have to go in the different direction she insisted that I take her autorickshaw and she will be able to cajole other driver given her wheelchair status. I knew how difficult would that be as people around are quite insensitive to other's problem except mocking it off. And in no situation I wanted to leave this angel alone at the road at that situation and suggested to go together till a mid-point in the pretext of meeting my doctor. She agreed and we hopped onto an unforgettable ride. That one instance filled my heart with great love and respect for that girl who in spite of her disability offered me help. The girl's name was Vidhi and she was wheelchair bound due to polio. Vidhi has done something many well-abled people cannot do. She worked in my office and met me occasionally. I reprimanded her few days back when I heard complain about her work that I feared will come in her way of progress and career growth. Being a disabled, I understand the importance of being financially independent for a girl and admonished her few weeks back for leaving her studies in mid-way. You know what, this restored my faith is good deeds. Out of 10 conflicting people, there will always be 1- 2 people who will appreciate your goodness and live by example. All you need to do is to #SpeadTheVibe, spread the good Vibe. Disability/deformity is such a low blow in society. Unfortunately, irrespective of our modern outlook, we all see disability with one frame glasses only. We must realize that disability is nothing but a dynamic situation and can happen to anyone, anytime. Only a good cheer and positive vibes can steer us through. It is high time we need to change our outlook and spread good vibe in society at large. Dheivam manushya roopena (God disguised as a human being). Even ordinary people have the power to do extra-ordinary things. From time to time we meet such people who appear ordinary or even lesser than ordinary, yet might prove they're an angel in disguise. It's nice to read about your experience. Really inspiring.